So does anyone else watch this show? I just got into it, and I gotta say...I love it. 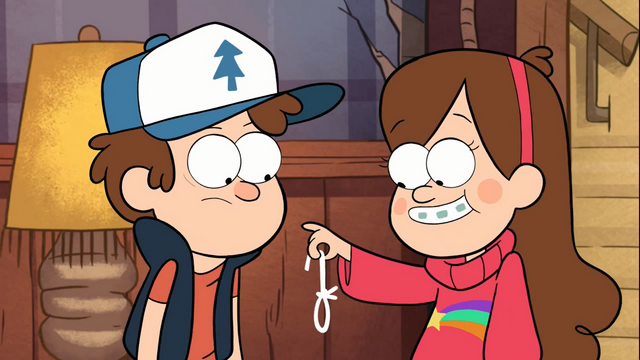 It's created by Alex Hirsch, who wrote for The Marvelous Missadventures of Flabjack and Fish Hooks. So if you liked either of those shows, you'll certainly dig this one. It also has a bit of a Regular Show meets Billy and Mandy kinda feel. 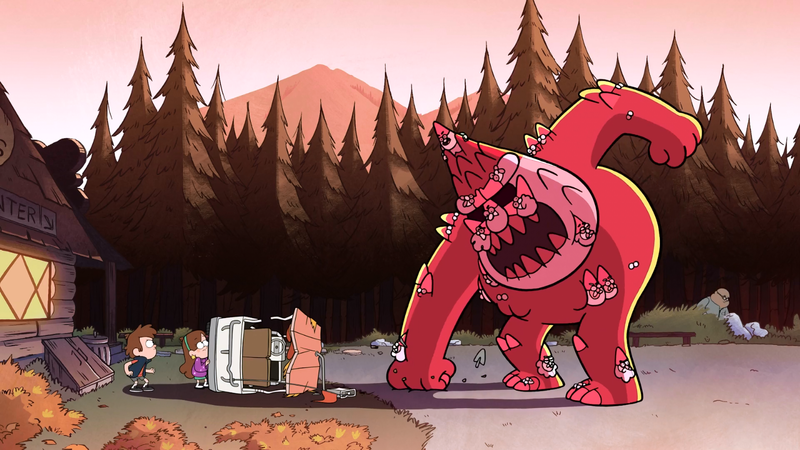 Either way, Mabel Pines makes this show for me. But I'm a total sucker for Kristen Schaal. Oh my gosh, you like Gravity Falls? I like Gravity Falls too! What is happening here? Also, word on Tumblr is that episode 6 got leaked. 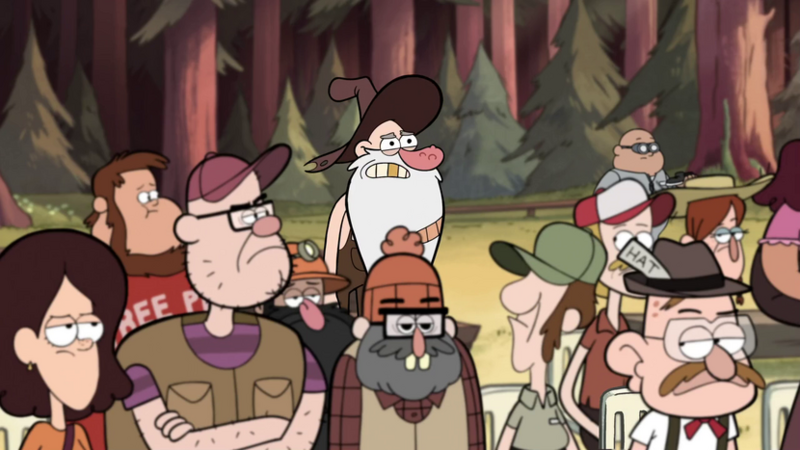 Okay, so we know Grunkle Stan has this big secret. We know there are at least three of the books, Mabel is easily possessed, and I'm going to say that Soos is not to be trusted. I'm not fully caught up, but so far...I'm thinking Grunkle Stan is the original owner of those books. You have released a can o' worms that can never be closed. Let the spam come. I guess I kinda..."spilled the beans." Soos seems to be harmless(I thought it was Zeus when I first heard it). I thought Wendy would be used a bit more. She's on the title screen and had like 2 lines in the first 3 episodes. Yeah I'm kinda surprised how little she's involved with this show. When I first saw her I got this kinda Debby Thornberry/Franky Foster vibe, but she's pure background character. ANYBODY ELSE LOVE THE CREEPY LITTLE GUY THAT CHANTS EVERY TIME THE BUFF GUY STARTS BEATING SOMETHING UP? Because I do. I was glad when she got her own episode. All I can remember is theres a Dad who punches things and his sons cheer him on. Rewatch the scene where he's punching the fish in episode 2, and the one where he's in the biker bar in episode 3. There's a creepy scrawny guy that pops in and cheers him on too. well I hope that there is one of those scenes in the next episode so I can just see it there. Anyone else notice the guy who only pops up for one scene per episode? Also I just watched episode 4, and Lil Gideon is voiced by Thurop Van Orman eeeeeeeeeeeeeeeeeeeeeeeeeee it's impossible not to love that man. I hope he's a reoccurring character. Oh wow I haven't noticed him at all. Oh, god "Dipper Vs. Manliness".